HJ: The more I learn about Tachyon energy, the further I am intrigued about its incredible healing potential and spiritual properties. Furthermore, compared to other metaphysical products, tachyonized glass is relatively affordable making it accessible even for those who do not have great financial means. Compared to many other powerful healing technologies which can be quite disruptive and even debilitating when used improperly or before one is truly prepared for its effects, Tachyon energy is much safer and one might even say benign. This is an important aspect as one can be greatly ‘sidetracked’ when using technologies they are not prepared for, whatever form they may take. The way I understand Tachyon energy is similar to the lightbody template, in which the Tachyon energy, like the lightbody template, is a perfect, complete form which we can access to return ourselves to a more perfect state. One simply need be exposed to the Tachyonic energy field to experience these effects. Therefore pendants, small amulets and talismans can readily be held and kept in ones field for maximum benefit. Apparently the discovery of Tachyon Energy and its use as healing modality originates in the Pleiades, and has been brought to Earth at this time in history to help heal those who are ready for such technology. This absolutely incredible and well written article will surely answer nearly any question or concern you may have regarding Tachyon energy and its effects on the human physical form. I highly encourage all of those readers who have experience with Tachyon energy to share their experiences in the comments section of this article so that all may benefit from your knowledge. So we know that, just like photon energy, all subtle energy systems that are used for therapies have this one big limit, they only work on their specific frequency. The other limit is that the effect of any particular frequency is determined by the nature of that frequency. Photon energy, orgone energy, or electromagnetic energy, for example, can help because each has certain characteristics that forcefully affect the human body to move into another direction. However, if we don’t need this particular, specific frequency, such energies can also be harmful. Tachyon energy is totally different from all of these. Tachyon energy is not a certain type of energy, but rather includes all energies in itself. Whatever goes wrong in our physical body or in the subtle bodies, can be corrected by applying specific information for that particular process. This is possible through Tachyon energy, for Tachyon energy is the gateway back to Zero Point energy. This is something that no frequency can do. All frequencies are just part of the whole, part of what is anchored in the Zero Point energy, but all frequencies are limited in their specific effects. Tachyon is totally non-specific. Tachyon really doesn’t have any effect in and of itself. What Tachyon does is give our organism, our body, our subtle bodies the chance to produce whatever effects they need. And since our bodies are incredibly intelligent, they always produce the effects that are good for them. The two limits that we find confining all other forms of energetic medicine just don’t apply to Tachyon because Tachyon energy is not limited to a certain frequency. Another important difference between other subtle energy devices and the energy that they use and Tachyon energy is that Tachyon cannot be influenced in any way whatsoever by any other form of energy. All other forms of subtle energies that are used in energetic medicine can be influenced, for example, by one’s own thoughts and feelings. This is due to the fact that below the speed of light energies have something that is called the gravitational pull, that makes energies attract each other so that they stick to each other. This, of course, creates influence, changing and altering the energies in their specific effects. Tachyon moves beyond the speed of light so it has no gravitational pull so it cannot stick to anything or any energy, and no energy can stick to Tachyon. No matter how “bad” our thoughts are, how low our emotional content is, no matter what kind of negativity we produce in any form it can never alter Tachyon energy and its ability to give us access to the Zero Point energy. So potentially, all problems we have- mental, emotional, spiritual, or physical- can be positively affected by Tachyon energy! Another wonderful aspect of using only the source energy is we do not have to deal with unwanted side effects. Even if we apply so much energy that parts of our organism want to have a very strong, very quick healing effect and other parts don’t quite catch up, this won’t be a problem. It sometimes causes detoxification and healing reactions, that for a very short time may feel overwhelming, but there will never be a negative outcome. Tachyon energy is also free of that second limit. It doesn’t require so much knowledge and experience to apply Tachyon correctly because the body is in charge of the process anyway. We do not forcefully apply it for a certain specific effect, but we rather let the body produce its own healing effects. Tachyon energy is simply the natural catalyst for this self-healing process. Through the search for Free Energy, science postulated, at first, and then indirectly proved Tachyon Energy.s existence. Today, we all envision its potential. Despite all opposition, the Tachyon era has begun. In 1977, Gerald Feinberg defined Tachyon Energy as a “faster-than-light, subatomic particle” in order to unify the scientific world.s view and nomenclature of faster-than-light energy. In quantum physics, the energy that fills the cosmos is called “Zero-Point Energy.” Formless, faster than the speed of light, and omnipresent, Zero-Point Energy is infinitely intelligent and contains everything needed to create perfect form. It has no spin, frequency or oscillation. It has no gravitational pull. Tachyon Energy is omnipresent, limitless and has all the potential information to create perfect form in the universe. 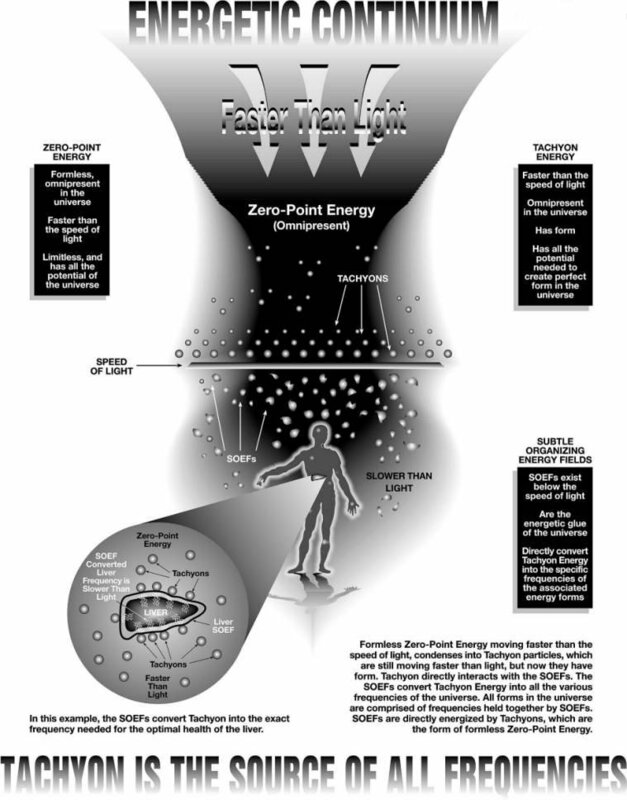 The condensation of Zero-Point Energy into Tachyon energy is the beginning of the “Energetic Continuum,” which is directly responsible for all forms on the planet. The next step in this Energetic Continuum is best explained in simplified terms of physics. The first elementary particle in the Lepton Family is a pion. The pion exists below the speed of light and has a consistent, mathematically computable orbit. We call this orbit a “Subtle Organizing Energy Field” or SOEF for short. SOEFs exist just below the speed of light and are directly responsible for converting Tachyon Energy into the frequencies required to evolve, organize and create perfect form. All forms are comprised of different frequencies. The SOEFs convert Tachyon Energy into the particular frequencies needed by a particular form. In this case, the SOEF we’re discussing holds the pion in its orbit. The pion.s SOEF, existing just below the speed of light, interacts with faster-than-light Tachyon. As the Tachyon Energy is converted into the pion’s frequency by the SOEF, the pion evolves in an instant into a muon. The new muon has an orbit, which is 10 times larger than that of a pion. The muon’s SOEF still exists just below the speed of light. As the SOEF of the muon interacts with Tachyon, the orbit once again expands, and the muon evolves in an instant into an electron. This new electron has an orbit that is 207 times larger than the muon’s. This continual process of SOEFs converting Tachyon into the needed frequencies does not stop here, of course. The effects of energy with a specific frequency, as used in vibrational medicine, are limited to the range of that frequency. Photon energy, for example, is described as pockets of light energy. Scientists use this concept to refer to the particle-life aspects of light. Photons are always associated with an electromagnetic wave of a definite frequency. The frequency is between .4 and .64 micrometers. There currently is one frequency energy tool that emits photon energy from the far-infrared spectrum of .4 – .16 micrometers wavelength. This is a small electromagnetic wave of the total frequency possibility of photon energy. All subtle therapeutic methods other than Tachyon are only isolated frequencies of the whole. Accessing the complete spectrum of frequency and information to clear the entire system and restore total functionality of our Energetic Continuum is very rare and difficult using a single frequency approach, because people may have multiple blocks at different frequencies. Energies of a specific frequency can also have harmful effects. There are two basic reasons for this an excess of any frequency can potentially be just as harmful as an energy deficiency; since a frequency has no intelligence, it is left to the wisdom, insights, and training of the user to determine the actual exposure time and which specific frequency is needed. For example, the sun is a magnificent source of photon energy. Approximately 20-30 minutes of exposure per day is necessary for optimum health. Yet, this same ball of photon energy will burn you to a crisp if you are exposed for 4 – 5 hours. The reason for this is that photon energy, like all frequencies, has no intelligence and doesn.t know when to start or stop! So, it is up to the user to decide when to stop the exposure by getting out of the sun. Another wonderful aspect of using only source energy to bring balance to our beings is that we do not have to deal with unwanted side effects. Even if we apply so much energy that parts of our organism experience a very strong, very quick healing effect, and other parts don.t quite catch up, it is not a problem. Tachyon Energy sometimes causes detoxification and healing reactions. For a very short time, one may feel overwhelmed, but there will never be a negative outcome. Tachyon Energy is also free of another limitation. It doesn’t require a lot of knowledge and experience to apply it correctly because the body is in charge of the healing process. We do not forcefully apply it for a certain specific effect. We let the body produce its own healing results. Tachyon Energy is simply the natural catalyst for this self-healing process. Once upon a time, science and spirituality split; each following its own path towards the source of existence. Tachyon is a synergistic energy, merging the scientific and spiritual paths back into “oneness.” unfolding our spiritual potential, attaining harmony in all areas of life, and establishing radiant health are natural goals, Achievement of these goals is directly dependent upon how well our Subtle Organizing Energy Fields convert Tachyon Energy into all the various frequencies flowing through all the subtle levels of our being and then finally into our physical body. We do not have to turn ourselves into something we really are not. Instead, we can become “super conductors.” sin science, a super conductor is a material that has no resistance to the flow of energy. What we must try to do in terms of achieving optimal health is create a spiritual, mental, emotional and physical body that is a super conductor. This means having no resistance to the flow of cosmic energy coming into our life through the Energetic Continuum. From the spiritual side, we have to realize that we are co-creators in our state of health. If we do not create any blockages in the flow of energy going through our system, our spiritual potential can unfold. We are able to establish radiant health in our lives and consequently, higher levels of joy. As super conductors, we reach for a state of optimal health and the highest level of order in the process of “order-chaos-order-chaos-order.” This process is what happens when we clear blockages using Tachyon.. Each block we clear adds to the joy of the cosmic energy flowing through us. We can literally feel this happen. As we repeatedly experience it (and experience the Divine Energy consistently filling us with joy, peace and contentment), we begin to understand that we are part of the Divine Energy. We have choices in our lives that we have to make. Do we choose to create a lifestyle, a diet, a way of being in the world that helps us become more of a super conductor? Or, do we choose to ignore the laws of nature and the Divine – in essence creating more chaos, entropy and degeneration in our lives? How do we make these choices? Is it only a conscious choice or are there other factors taking place that influence this very critical life-enhancing or life-depleting decision? What determines whether we choose to become more of a super conductor or less of a super conductor for the Energetic Continuum? The answer lies in the moment of truth. In 1990, David Wagner developed specialized tools and techniques that can cause a bifurcation of an energetic system during a treatment administered by a trained Tachyon Practitioner. With the advanced application of Tachyonized tools and reconnection of the being’s system to the Energetic Continuum, the trained Practitioner is able to help the “body-mind-spirit” complex move towards a higher level of order and health. However, you don’t have to be a trained Practitioner to experience the life-enhancing benefits of Tachyon Energy. Anyone can begin benefitting from Tachyonized tools by simply applying Tachyon Energy to a localized area. Whatever frequency is needed is converted into biological energy by the SOEFs, so that the body may heal itself. Following is an actual example. A wonderful example of Tachyon.s negative entropy (balancing) effect can be demonstrated using two rose buds, cut from a bush. Rose “A” is placed into plain distilled water. Rose “B” is placed into pure TachyonizedTM Water. Rose “A” opens, the stem collapses, and the flower wilts after 2 = days. This represents the normal life expectancy of the variety of rose used in this experiment. The water for Rose “A” is then replaced with pure TachyonizedTM Water. As a result, the stem becomes erect and Rose “A” reopens for another three days. Meanwhile, rose”B”, which has been sitting in the TachyonizedTM Water, opens and remains fresh for nine days without any signs of wilting. The TachyonizedTM Water charges the SOEFs of Rose “B,” which actually slows the effects of the aging (positive entropy) process. Further observation of the stem of Rose “B” demonstrates quicker-than-normal root development. After eight more days, the stem was planted and a new rose bush was the outcome. The world has now begun to embrace its future. Many companies from around the world, including the United States, Japan, Germany and England, are using our joint venture “Heal the Planet” program. This program allows the TachyonizationTM of other companies. products, or the use of Tachyonized specialty products in the manufacturing of new products that will help heal the planet. A good example is Vita-PurTM, a live enzyme drink derived from kombucha mushrooms specially grown in a custom-developed Tachyonized field. This European drink also contains TachyonizedTM Water. Another example is the Phone~CellTM, which was specifically developed in a joint venture with Japan and Germany to eliminate the negative effects of cellular phones. Through joint ventures, new products can be developed for correctly aligned companies. If you have an idea that would benefit the world, please contact us. Most people exist in a fragmented, horizontal energy system. Becoming vertical in our energy flow is a way of accelerating our shift in consciousness. Through the use of a special Tachyonized tool called the “vortex pendant,” there is a way to shift into a vertical state. This allows many people to access the benefits of verticality. This is a boon to the spiritual seeker. When we.re vertical we feel more “connected,” and aligned with the cosmic process in our everyday lives. By learning how to use Tachyon Energy, we can learn to restructure our system back to its natural, vertical state. The beauty of the Quality of OneTM workshop, created by David Wagner, is that one learns to work with the TachyonizedTM Vortex Pendant and various techniques that assist the verticalization process. This gives the seeker a real opportunity to integrate the wonderment of this higher dimensional alignment in a way that enhances and acts as a divine feedback system. This encourages one to continue and evolve on their spiritual path. However far-fetched such a concept may seem, concrete evidence exists to back up the theory supporting Tachyons and a Tachyon Field. Electrons seem to appear from nowhere, and disappear into “nowhere”. No one has been able to clearly identify a source for electrons that explains how they can be manufactured continuously out of “nowhere”. Some possible electron precursors, like the decay of light photons, can only account for a very small number of the electrons which exist. This fact begs for explanation, and Tachyon theory supplies some very reasonable answers. Yin/Yang theory of Oriental Metaphysics supports the concept of mirror universes. In Yin/Yang terms, all phenomena exist as dualities. For example, higher forms of life are created male and female. Atoms exist naturally as positively-charged protons surrounded by a whirling cloud of negatively-charged electrons. Even positive electrons require negatively-charged protons in the nucleus to balance and support their existence. Living forms developed and evolved by learning how to harness the Tachyon Field’s resources, and we continue to evolve by developing more and more sophisticated ways of accessing these resources. The nervous system and brain are nothing but an extremely sophisticated antenna and receiver to absorb, process and transform the resources of the Tachyon Field into our thinking, activity and creativity. We experience the Tachyon Field with our senses, mind and spirit as a warm, pleasurable, energizing and healing sensation. Healers have learned to access the Tachyon Field’s resources for its healing powers more successfully than the average person has. Belief in a “Higher Power” enables them to draw upon the Tachyon Field. The more they draw upon it, the more effective as healers they become. They often acknowledge they are simply channeling the Tachyon Field’s resources into the everyday world. They know the resources are infinite, and freely available. Throughout history they have called this infinite resource by many names. While tachyon theory is at the frontier of physical research, there is now adequate knowledge regarding electromagnetic field interaction to explain energy healing. Tachyon energy is mentioned because there is always another layer of the onion to explore. I often visualize the galaxy from the outside the way humans may visualize a cell. Perhaps the planets are in some way similar to electrons orbiting an atomic nucleus (the sun). At the same time, the galaxy may be but an infinitesimal particle of say, a blade of grass of a larger system, which may itself be but a tiny particle of another system, etc… If the macrocosm (from our perspective) mirrors the microcosm, then the microcosm in turn reflects the macrocosm. At the level of atomic particles there may exist many levels of energy and life too small for us to perceive. A proton may be an entire “world” filled with lifeforms similar to the world of the earth. One of the most spiritually powerful, yet extremely subtle forms of energy generated by these new, hi-tech devices has been named ‘Tachyon Energy’ by its inventor. Tachyon energy is unique because it doesn’t have a fixed frequency or range of frequencies, but has instead been called ‘the source of all frequencies.’ It is an anti-entropic, organizing force that charges the subtle energy organizing fields that underlie our material reality and many levels of our spiritual reality, too. It brings energy from the energetic source of existence and channels it into our bodies, minds, and beings. These devices have profound effects, especially when used during meditation. During meditation, the mind, body, and subtle-energy bodies are able to absorb and utilize this energy, facilitating quantum leaps in spiritual growth and realization. This energy will help shake loose damaging patterns that have been embedded in your energy field over many, many years, and will help ‘illuminate’ your field and charge it with energy, making you more conscious of your subtle-energy bodies’ workings and natures. In addition to its profound spiritual effects, Tachyon energy is also extremely healthy for the physical body. In scientific experiments, plants exposed to Tachyon energy grew faster and larger than those that weren’t (by a factor of two to three), mice that were exposed to this energy on a continuous basis lived 40% longer than those that weren’t, and cut flowers placed in Tachyonized water lived weeks longer than cut flowers placed in normal water. In people and animals, it is clear that exposure to this energy helps the body to heal, reduces pain, and generally improves quality of life. Of the chakras along the central channel, the most important ones to energize in meditation to start are the heart, the Dan Tien point (about two to three finger widths below the navel), and the third-eye chakra (on the forehead just above and between the eyes). Next after these three comes the solar plexus chakra. Then, the base and crown chakras, then the throat chakra. It is important to energize the lower and upper chakras somewhat equally — if you energize only the upper chakras, but ignore the lower chakras as being ‘less important’ or ‘less spiritual,’ it will throw your body out of balance, and create a great deal of psychic tension for you. This is why I advocate energizing the chakras in an order that generally balances the whole system, and doesn’t emphasize just one chakra, or the upper or lower chakras. To energize a chakra, all you have to do is tape a Tachyonized cell or a Tachyonized four inch disk over it, and leave it there while you meditate. Generally, I suggest the 35mm cells to start. This is because most people will find the Tachyonized disks uncomfortably intense to leave on their chakras for very long. The 35mm cells are much more comfortable and gentle in balancing your energy. If you do choose to use disks, the first disk should go over the Dan Tien point, as this is the point at which excess energy is stored in the body, and is generally able to handle much more energy. In addition, the Dan Tien point can supply energy to any other chakra as necessary from its store, so a disk here is well-used. Where disks are concerned, it’s best (as in most things) to slowly work your way up, adding one disk at a time during your meditations with at least a week in between to grow accustomed to the new level of energy. Note that as an alternative to taping a 35mm cell over your third eye chakra, you can also buy a Tachyonized. headband that has a hidden pocket in the front that can hold up to three 24mm Tachyonized cells over your third-eye area. I generally find the headband to be a much more comfortable solution than taping the cells to my forehead, and it has the added benefit of supplying Tachyonized energy all the way around the head (since the whole headband is Tachyonized). Also note that it is OK to tape the Tachyonized cells and disks to your clothing on the outside, rather than taping them directly to the skin. The energy will go through your clothing without any problem, and it’s generally more comfortable not to have tape on your skin (or have to remove it later). The Tachyonized Silk Meditation wrap bathes your whole body in Tachyonized energy, and is generally very good to meditate with. Certainly, it feels really good to wrap oneself in, like wrapping yourself in a warm, soft blanket on a cold winter night. This good adjunct tool is best used in addition to cells or disks over the chakras, as the cells and disks provide much more directed, focused energy where it is needed the most. This being said, the Silk Meditation wrap is the most energizing and best-feeling meditation blanket I’ve ever come across. The Tachyonized Cocoon is an effective tool for surrounding all of your chakras and energy centers, front and back, with Tachyon energy. Lying down in the cocoon, one will almost immediately slip into a deep trance state, regardless of whether you are ‘trying’ to meditate or using meditation soundtracks or not. It’s very easy to slip off into an entirely different space while in the cocoon; some people will be conscious of this, others will just think they had an unusually deep and restful sleep. This is a very good tool for relaxation, energy balancing, journeywork of any kind, and meditation in general. (It also makes a very good demo to share with your friends, as it will undeniably do something for everybody). I highly recommend it. The cone (26mm, 1 inch high) aids all chakra work, physical healing and work in the aura. It works in a similar way to the pyramid and can be used for support in all areas of life. It can be placed upon the body, on a work desk, carried in a pocket in a pouch or placed near the bed at night. Donuts can be worn as pendants or carried in a pocket. They come in three sizes, small, medium and large and can be used for people, animals, food and plants.These have no spiral, are the gentlest and are recommended for children and elderly people, those not used to energy work, for pet animals (particularly sky blue and placed in bedding) and pot plants. The Star-Ring has a direct cosmic connection and supports and awakens the being as a cosmic being. It reminds us of our cosmic origins and works with these connections whenever it is worn.It consists of two twelve pointed stars on a ring (40mm, 1.6 inches diameter). Star Wands (240mm 9.6 inches long and 25mm, 1 inch wide) can be placed in all four corners of a room to raise the vibration and to balance and harmonise the energies within it.It can balance and synchronise the two halves of the body and the brain. It assists affirmations and considerably enhances the depth of meditation when held with an end placed in each palm. Thess come in two sizes: small (50mm, 2 inches long) and large (60mm 2.4 inches long). Based on the ancient Kabbalistic Tree of Life they support and assist personal healing, mental and spiritual processes, personal potential and work on the chakras. They help to integrate spiritual insights into everyday, stressful situations. This design is the clearest expression of the Kabbalistic background of Materia Tachyon .. We.ve brought the Tree of Life into three dimensional form which, combined with Tachyon energy, produces a special effect. Mental, emotional and/or physical releases become possible and the highest potential of the user is activated. It is perfect for working on very deep seated blockages. Available in two sizes, large pendant and smaller hand-held.